NGO Korea Food for the Hungry International (KFHI) Goodwill Ambassadors Park Shin Hye and Jung Tae Woo joined volunteers today to promote KFHI's annual food aid campaign. 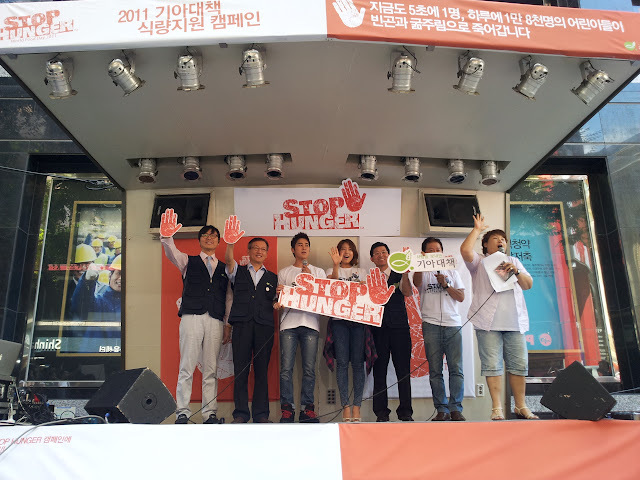 The 2011 KFHI global food aid campaign, 'STOP HUNGER' promotional event was held from 11:50am to 1:30pm in Myeongdong, Seoul today. The aim of the campaign is to 'fight against extreme hunger and poverty' by raising the awareness of international hunger issues and to promote the food aid fundraiser to all walks and personnel of society. Park Shin Hye and Jung Tae Woo made rice balls in the middle of Myeongdong today to raise funds for the campaign. Citizens could taste the cooking of the idols by donating 5,000 won to 'STOP HUNGER'. Other than that, Shin Hye participated in a hand-printing ceremony to commemorate the event. 'STOP HUNGER' campaign runs from August 1 to October 31. The campaign has a target of reducing 1% of world population that is living in extreme poverty. Meanwhile, the international World Food Day 2011, organized by the United Nations, will commence on October 15. Korea will celebrate the day with providing 100,000 food kits to various third world countries such as Zimbabwe, Tanzania, Ecuador, Tajikistan, etc. ..so young and vibrant and so concerned with the welfare of others.....God will surely bless you more than what you expect!!!! Let us also take up this challenge guys. Fighting! 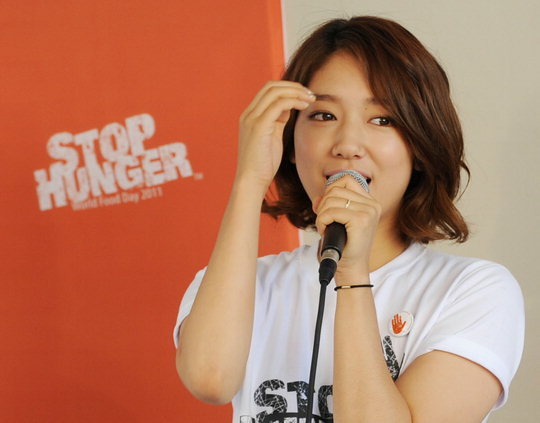 Shin Hye has such a beautiful heart! i'm so proud to be her fan..so young and yet already so concerned and giving to the less fortunate..may god bless you!